Pink and white striped nursery curtains. Full length panels tie back to let in natural light. Silver fairy princess wall decals. I wanted a pink nursery made for a princess for my daughter. I spent hours and hours of my time browsing nursery pictures online, pinning and bookmarking my favorite designs. At a certain point, I knew that it was time to take inventory of my findings. At that time, it became clear to me that the primary color of our baby girl's nursery would be pink. I also knew that I wanted a subtle princess theme with some "bling". The results of all the time spent planning and organizing ideas are a dream come true. filled with frilly, feminine fabrics, colors and decorations right out of a fairytale. After we were satisfied that the wall paint color was exactly what we wanted, we painted the lower third of the wall white and lightly sponge painted pink over the white paint to make it more interesting and give it depth. The first thing we did after we learned that we were having a baby girl was to paint the entire wall in our guest room a soft shade of pink. After the paint was cured we hung a pre-pasted wallpaper border to join the two colors. The princess castle wall decal over the baby's dresser sends a clear message that this is a room for a beautiful girl. We chose satin bedding for our baby girl's crib set and it looks fantastic with the nursery furniture that is stained a dark color. The silky fabrics look amazing against the textured wood. The "crowning" touch of our project is the gauzy, white canopy that I made that drapes from the ceiling and over the head and foot of the crib. The pictures of the nursery don't begin to show how luxurious look of the place where our baby girl sleeps. 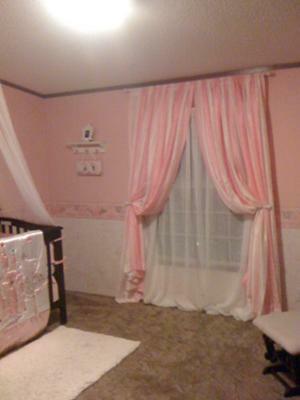 Solid pink curtains would have been too much with the upper part of the solid pink nursery walls. But the pink and white striped fabric of the full length curtain panels tie the room together perfectly. I love how I can use the tiebacks to take advantage of the natural light whenever I want. The entire princess baby nursery theme is delightful so it would be very difficult to choose the best nursery decorating ideas or area of the room that I like the most. 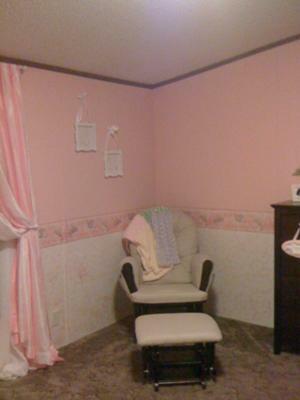 But if I had to pick, I suppose it would be the cozy corner where the nursery glider is. This is where I will spend the most time reading and sharing stories about storybook princesses with my baby girl. Now that we are done decorating the room in pink and white with just a touch of sparkle and silver to give the room a royal atmosphere; we are ready for our daughter to arrive. I'm sure that I left out a few details of how we decorated our white and pink nursery. But if there's something that visitors to Unique Baby Gear Ideas would like know, they are welcome to leave a note with any questions that you may have that I will get back you as quickly as possible with answers. Pink is definitely perfect for a princess nursery and the pink curtains and the canopy over the baby crib is very "royal" indeed! Great work on painting those stripes on the wall, too! Love it. exactly what I'm looking for doing first great grandaughter's nursery. Can you e-mail me to share where to buy the canopy. I just know your baby girl loves her room. 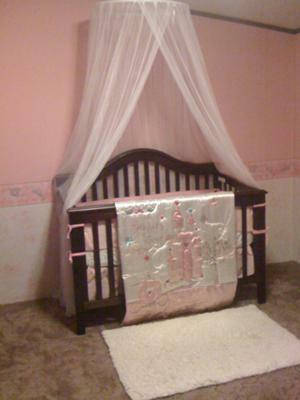 This is lovely.I am sure she will like it and I enjoyed reading the information on www.unique-baby-gear-ideas.com regarding blackout curtains for girls. i love the satin above the crib! Wondering what happened to all the comments that were on here.